I am very, very pleased to say that the incomparable Rev. 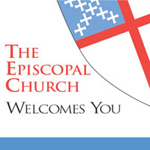 Jan Nunley of the Episcopal News Service has started a blog: epiScope -- looking over the Episcopal Church. It's going to be one of the first blogs I check every morning; Jan is always insightful, and follows the news like nobody else I know -- plus she's got a fabulous sense of humor that I hope will be given rein on the blog. Welcome to the blogosphere, Jan -- everyone, do check out epiScope! In August, I had a brief chat about the wonders of Typepad with one of my new neighbors who was thinking of starting a blog. Start one she did, and it's well worth checking out. B.K. Hipsher's "In My Lifetime" -- an important voice from someone as insightful as she is sensible, and who's deeply passionate about God's Good News. I find fascinating the story of The Mystery Bullshipper, who (it seems to most reasonable observers) adopted an online persona so he could post glowing reviews, supposedly authored by a female layperson, of his singing, preaching, and liturgical sense. What grabs me most, I think, about it is the question of why someone as successful as this priest seems to be (he's a Priest Vicar at Westminister Abbey, and travels internationally as a preacher and presider at Anglo-Catholic services) would feel the need to lie repeatedly and publicly to get more publicity. I suppose that's not such a mystery, though. I've met many very successful people who are so successful in part because they're so driven; they take risks to achieve what they see as great things, and if they're bright enough they can calculate those risks well enough to choose mostly the ones that will pay off. I imagine that same drive and compulsive need to be seen as great could motivate someone to take risks that are unlikely at best to pay off, and a constantly nagging fear of being found out as not so great could lead a person to make some very unhelpful choices in hope on some level of being caught, and hence not having to keep up the charade. Dave Walker of the ever-brilliant Cartoon Church was led by the story to offer these helpful observations on Internet anonymity. I sometimes envy friends who have pseudonymous blogs; there are lots of things one can share and receive sympathy or applause about when one is anonymous that would be irresponsible or self-destructive to post when one's identity is known. But whenever I've thought about finding or developing some venue where I can post anonymously [*], I've thought about how exhausting and worrying it must be to wonder whether or when I'd be found out, and concluded that I'm better off taking the advice I've given to many a pseudonymous blogger: not to publish anything, even pseudonymously, that would deeply embarrass or hurt someone (including me!) if it received wider publication in a different context, and with my name attached. I figure that posting anything pseudonymously would just tempt me to think I wouldn't be held accountable for what I said, which would serve mostly to tempt me to say things better left unsaid for my own sake as well as others'. I do know many pseudonymous bloggers -- Gordon Atkinson of Real Live Preacher, for example, who blogged in anonymity as far as the public was concerned until his book came out -- who have done it well. Gordon used anonymity not to find more opportunities to attack opponents without accountability, but to be more honest about his own struggles and doubts, and I think the degree to which he used anonymity responsibly can be seen in his ability to keep going both as Real Live Preacher and pastor of his congregation after revealing his name. But for me, the accountability of being Sarah Dylan Breuer everywhere is helpful and perhaps even necessary. Here's a breathtaking post from Velveteen Rabbi (one of my favorite bloggers) on the Shirat Ha-Yam, the Song of the Sea from Exodus 15. Episcopalians: this is something to remember when the time comes for the Easter Vigil! I read TitusOneNine from time to time. I'll freely admit that most of the time my reaction is something like, “darn ... how does anyone with a full-time job that doesn't explicitly imply paid blogging ... ” -- as “Canon Theologian” doesn't scream to me -- “ ... manage to post this man articles a day while still paying the proverbial rent?” (occasionally I wonder how much content the “web elves” mentioned from time to time post). Read the reaction and comments at the Titusonenine blog, and you'll get a sense of how average people react to Mr. Robertson. As in, the whole entry on blogpulse is about Pat Robertson's pronouncement that Ariel Sharon's stroke is God's judgment on pulling back from some territories Israel has claimed in Gaza. The full title of the entry is worth noting: “Let Us Pray...for Religious Integrity? Legal Proof? A Gag for Pat Robertson?” Kinda implies that TitusOneNine is as lacking in religious integrity as Pat Robertson's view that Sharon's stroke was God's vengeance on his step back from unrestrained expansionism. But hey, who woulda thunk that Kendall Harmon would cite as a bolster to his own blogispherical authority someone who refers to God (In the very entry he cites) as “she”? That's the tagline for Global Voices, a weblog that's new to me, but which I wish I'd been reading since it started. I've been wondering for ages whether there's something I could do that in some small way might encourage more Americans to seek out and listen deeply to more people elsewhere. Blogging and the Internet are used every day to sling mud faster and over greater distances than ever before, but they're also media through which it's possible for anyone who desires to listen to ordinary people coming from very different places -- socially and culturally as well as geographically. Global Voices. I'm listening. This is an amazing post from a remarkable blog. I've started reading a blog that's become important to me, and I encourage y'all to check it out. It's a blog that reminds me of how I felt when I first encountered Anglicanism, over a summer in Kenya between my first and second years at university, and when I first started questioning the systems that make the world well, what it is -- in a state with such a divide between rich and poor that I don't know how to describe it when I try. And whether your heart is in Africa or not, I encourage you to read this post from that blog. I grew up in Los Angeles, where you couldn't walk more than a few blocks in any but the most segregated communities (and there are far too many of them in Los Angeles, as elsewhere) without seeing a business making usurious amounts of money “helping” poor people send poorer people money. I live in a town in Maryland now in which I think I've driven past at least four or five such businesses now catering to people from Central America, mostly El Salvador, wanting to send money to relatives there (and, by the way, in which my denomination does nothing at all in Spanish ... no services of worship, no services at all. I'm hoping to be able to scrape together enough money and time to get from stammering to fluency in Spanish by September, which is a challenge, since my regular gig is part-time, and it's supplemented by occasional gigs of guest preaching and such which are hard to turn down, but are staggered such that it's hard to leave the country for 6-8 weeks). My good blogfriend Gordon Atkinson (better known as Real Live Preacher) has moved to new cyber-digs, and I'm really impressed. It's powered by Drupal, the free, open source, PHP-based content management system I recommended for the parish I used to work for (but did they listen? nope.). Because it's open source, lots of people have developed and are sharing (free!) modules to do all kinds of fabulous things, and Gordon's employed Matt Sturges, a talented PHP programmer, to take full advantage of Drupal's capabilities. I was fortunate enough to preview the site before it went live to the public, and I was already drooling. Now that it's "gone live" and I've seen it in action for a couple of days, though, I think it's fair to say that Real Live Preacher is a genuine online community, not just a blog. It had been moving in that direction for a long time -- there are few places online where so many people share so much via blog comments -- but now the technology behind it has caught up with that interpersonal dynamic, and I'm really looking forward to seeing what comes of that. Congrats, Gordon and Matt! I've particularly enjoyed chatting with RLP readers real-time on the site, and this morning I met Keith, who's got me drooling over possibilities for using my PowerBook to compose music. I'm sorry to say that I've hardly written a thing musically over the last ten years, so it was wonderful to spend some time in our friends' wabi-sabi mountain retreat playing with GarageBand, which came free with my PowerBook G4. I got the PowerBook instead of replacing my old iBook with another one of the same lower-cost and lower line partly because I had starting using my laptop a lot to compose visuals for multi-sensory worship liturgies (like the one I describe here) I was doing with the youth groups where I worked (I was working my way up to doing similar services for all ages, including adults, when my parish position was eliminated). My iBook was starting to pose some serious limitations for what I could do liturgically, so I thought a more powerful machine was justified. But I also had hopes that when I got a computer that could handle it more easily, I'd start composing and recording music once more. It's amazing what you can do these days using just a laptop, a good pair of headphones, and a couple of adaptors plus GarageBand. I started writing a little R&B-inflected number, I digitized a demo I recorded in analog about 15 years ago, and just for fun, I started playing with GarageBand to come up with deep-house style remixes of my old acoustic material. And then this morning in the Real Live Preacher chat room, I met Keith, who's a composer. Now I'm completely drooling over what I could do just with a little portable MIDI controller like this and my PowerBook. Add an interface like this, and maybe an assortment of software instruments, and I think I could do ... well ... a LOT. All of these things are luxury items and out of reach at the moment (especially until I find my next job! ), but I've got to say that my heart's beating a little faster at the prospect of being able to do with $1000 what you used to have to have a $15,000-plus studio to do. And thinking that way has motivated me to start writing music again, which cheers me even now.